To someone growing up in Asia in the 1960’s “boiled peanuts and a movie” is what “popcorn and a movie” is to the American moviegoers. As a child going to the cinemas in Singapore, I would always encounter boiled peanuts peddlers pushing large steaming kettles, mounted on tricycles, bursting with peanuts selling their fare. My friends and I would purchase packages of boiled peanuts in newspaper cones and bring them into the theatre. We would crack the peanuts noiselessly, as the moist soft shells split easily, and discard them on the floor. At the end of the show the floor would be full of peanut shells and I used to enjoy stomping on the shells making crunching noise as we walked out. But this reminiscing also brought out my feeling of disgust for how filthy that habit was. I’m glad that this practice doesn’t exist anymore. Boiled peanuts are still one of my favorite snacks. But I now enjoy them in a more adult manner. I like them as an accompaniment for a cup of hot tea or warm Chinese rice wine. Unlike roasted peanuts the mild non-nutty flavor of boiled peanuts does not compete with the taste of wine or tea. Drinking tea or wine with small dishes of nuts and biscuits is a regular leisure pursuit in China. Boiled peanuts are almost always a part of this ritual. Like many Chinese culinary ingredients peanuts are not native to China. Although there is no definitive record as to when peanuts were introduced to China, the speculation is that Portuguese merchants brought them to Chinese trading ports from South America around 1530. Peanuts are one of those New World food ingredients that were embraced whole-heartedly by Chinese and other Asian culture. 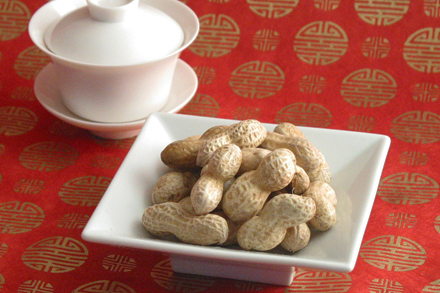 Now many Chinese dishes incorporate peanuts as a major ingredient. For example Gong Bao Chicken (or Kung Pao Chicken) calls for a handful of roasted peanuts and stewed pork ribs are often made with boiled peanuts. A common Chinese way of boiling peanuts is to add star anise and Sichuan peppercorn. This technique is often known as Five Spice Boiled Peanuts (五香花生) in spite of the fact that only two spices are added. Green unshelled peanuts or dried uncooked peanut kernels can be used. I like to use green peanuts in autumn when they are freshly harvested and are abundant in Chinatown markets. Occasionally I still enjoy boiled peanuts with a movie. But now I sit in the comfort of my home and watch the movie on a DVD player. I also use an extra bowl to collect the shells. Put all the ingredients in a large pot and simmer covered over low heat. There should be enough water to completely cover all the peanuts. If not, add a little extra water. Turn the heat off after 30 minutes and let the peanuts marinate in the liquid overnight unrefrigerated. The next day drain off the liquid completely and store the peanuts in the refrigerator. You can serve the peanuts cold or hot. To reheat the peanuts put them in a steamer over boiling water for about 10 minutes. This was a really great post. I have never had a boiled peanut – but this makes me want to make them! What a wonderful post, I can’t wait to try make these. I love boiled peanuts and these sound so delicious 🙂 Thanks for sharing! Oh, great post! They sound wonderful! Boy, that shows how dumb I am . . . I thought “boiled peanuts” were a product of South Carolina, where they have been enjoyed for over 150 years. I have been boiling Georgia peanuts (I like the Cajun spiced type myself) for over 50 years now . . . but I learned how to do it in the wonderful American state of South Carolina. I didn’t realize that the Asians had invented peanuts, boiled or otherwise . . . LOL. You’re right DocChuck. You are dumb. Boiled peanuts are consumed in many parts of the world. South Carolina included. It would indeed be interesting to find out if boiling was the cooking method in the Amazon area where peanuts originated. I love boiled peanuts! I haven’t had them for a really long time. I want to try boiling them… except I never knew which kinds of peanuts to buy and if they were still raw or not! Interesting… I work in chinatown, so I’m totally going to be on the look out for green peanuts today. Thanks! I am so surprised to learn that boiled peanuts are an Asian treat! 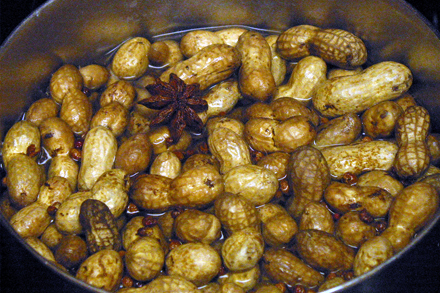 I recently included this wonderful treat in my blog – http://susancoggin.blogspot.com/2008/10/boiled-peanuts.html. Now I know they are an international snack! packages of boiled peanuts in newspaper cones, that’s long time ago. I only see this in the movie. _ts, If you can’t find green peanuts in Vancouver you can use this same recipe with uncooked dry peanuts. They are easily found in Asian stores. Marc, They are available in almost all produce stores in NYC Chinatown now. Go get ’em. Susan, Yes, boiled peanuts are quite common outside of American southern states. Just not the rest of America. Paul, You’re really making me feel ancient. It was a long time ago. sigh! Aiyaa! To find this now when I’m developing nut allergies! Boiled peanuts with the slight taste of star anise. One of my favorite snacks. What a good idea….. with tea. Any chance of sharing your “roasted” peanut recipe? I noticed the asian style is so different for the american style (?) roasted peanuts. Is it marinated first then slightly roasted? As it’s not completely dry and hard. Your post just gave me childhood flashbacks. My mother used to make big vats of boiled peanuts in just salted water. Although I never ate them at the cinema I would snack on them at home while watching a PG-13 movie. And I didn’t even know how popular they were in the South until a few years ago. what an excellent post. i really love boiled peanuts. I am completely going to try this recipe. Thank you! We have peanut bars around town that don’t bat an eye when patrons eat peanuts in the shell and dump the shells on the floor. I never thought about it being disgusting when I was younger but I don’t think I would patronize a place like that now. I love good salted shell peanuts and we keep a container of them on the countertop for snacking all the time. The best part is sucking the saltiness off my fingers when I am done. I’ve never had boiled peanuts though. I really enjoyed reading this article, as I’ve been a big fan of boiled peanuts. I also love boiled soy beans, made in the same way. I sent you an email couple of days ago, and I hope you got it. We wanna reprint this article on our magazine, and of course, we’ll give the credit to you and your website. Should you have any questions, please shoot me an email. Thanks a lot! I am facinated with this. My husband’s family loves boiled peanuts. They are a specialty throughout the South in the US. 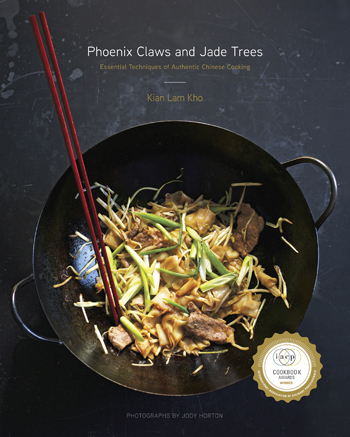 I always enjoy seeing other methods for preparation of such seemingly regional foods. I love the concept of enjoying them with tea or wine. How lovely. Thanks for this interesting post and the recipe. I loved hearing about your movie-theatre peanuts. 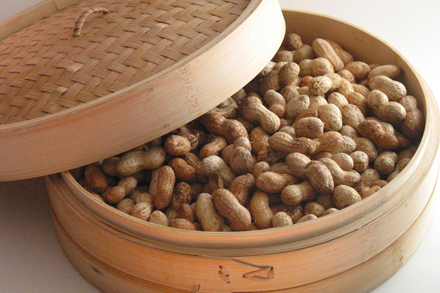 I’ve recently experimented with making Chinese-style boiled peanuts myself, and they’re great! I used the star anise but not the peppercorns; must try that next time. Previously I had only used salt when I boiled peanuts, or salt and Old Bay seasoning (which is also good). I was wondering if the chinese boiled peanuts are the same as the one’s I purchase in Chinese markets? They have a very unique taste and do not seem roasted. They are not as crunchy. If they are not the boiled peanuts, can you tell me how to make these delicious nut. Thanks!!! Also, I have purchased raw valencia peanuts. Can I use them in the recipe? I wanted to know if the “boiled peanuts” are the same one’s that I purchase in Chinese markets? The one’s I buy have a very unique taste and they are a little chewy. They do not taste like they are roasted. If they are not the boiled peanuts, can you share the recipe? I love these peanuts!! Btw, I already have raw valencia peanuts. Will these work? Thanks!! Hi Tina, I’m not able to tell you about he peanuts you purchased without seeing them. But if they are moist then it is most likely that they are boiled peanuts. As for using this recipe you can either use green peanuts or raw dried peanuts. Green peanuts are fresh peanuts usually in their shell. Raw dried peanuts in the shell are also available, but they are not really suitable for boiling. However raw dried peanuts out of the shell can be boiled using this same recipe. But cook the peanuts for additional 10 to 15 minutes. Valencia peanuts are great for boiling but they should be either green or raw dried ones. Thank you for getting back to me. I can tell you that the bag says roasted on it but they do not taste like the american roasted peanuts. They taste like they were marinated in something, perhaps star anise. They are not moist, however, they are a little chewy. They shells do not look as dark as the roasted american kind. Thanks again! I never thought that peanuts could be boiled. In Cyprus we usually cook them in the oven with salt. Thanks for sharing! I’m a bit late to this party, but it has got me thinking… since peanuts are really BEANS and not nuts, why couldn’t this be tried with other beans that are often roasted, like edamame (soybeans) and chickpeas and fava beans, which are sold as roasted ceci beans in Italian delis. …I’m off to the lab!